Hi my name is Abishai. Today I am going to talk about and tell you how to make a good pot of oatmeal. Normally, I make a pot of oatmeal for our family of six, and it usually feeds us for one week. We all really, really love oatmeal, even my little sister Astrid. She gobbles that stuff up. Well, that is enough stuff about me. Fill a big pot with all your water. Remember, this is for six people. Put it on to boil and add the salt. Pour the oats into the boiling water. Add cinnamon and allow to cook. Then add milk and let it finish cooking. Add brown sugar and stir. Then take it off the heat. Add vanilla and stir. After that, your DONE! Serve the oatmeal and let the rest cool a little bit before you put the pot into the fridge. So there is your recipe for perfect oatmeal and ways to make it even better by adding some pizzazz to it. Today I am going to talk about me being able to cross something off my bucket list. At Taco Bell they have a “Taco Twelve Pack”, and usually I share one with my dad and brother. We each get four tacos. Today, I crossed eating a “Taco Twelve Pack” off my bucket list. I, Abishai Powers, ate an entire one of them solo. My family nickname is Pig, but, wow, to be completely honest, by the time that was over, I felt pretty sick. I had never eaten so much food at one time before. It was invigorating. My colon was very energized by it, though, because I had to go three times that day. So, that is the story of me eating a “Taco Twelve Pack”. Hasta la vista, bro-migos! Note from Dad- As soon as I saw this title pop up in an e-mail newsletter, I sent a note to Sharon Gibson and told her that we wanted to try it for the boys. 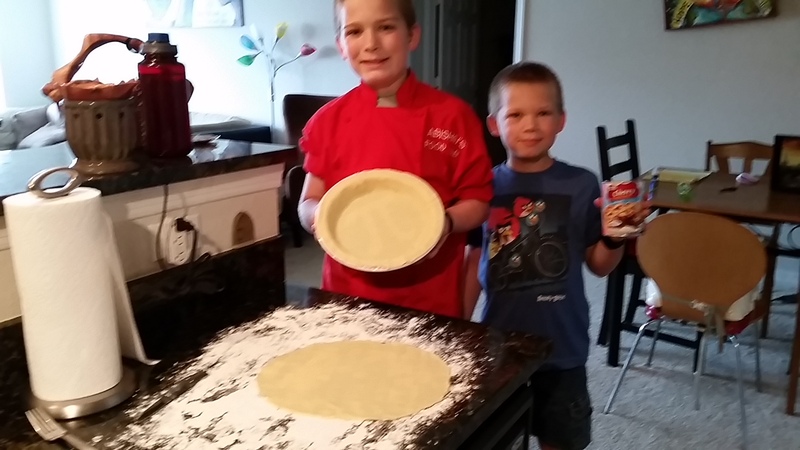 We’re big on making cooking a big part of our homeschool. 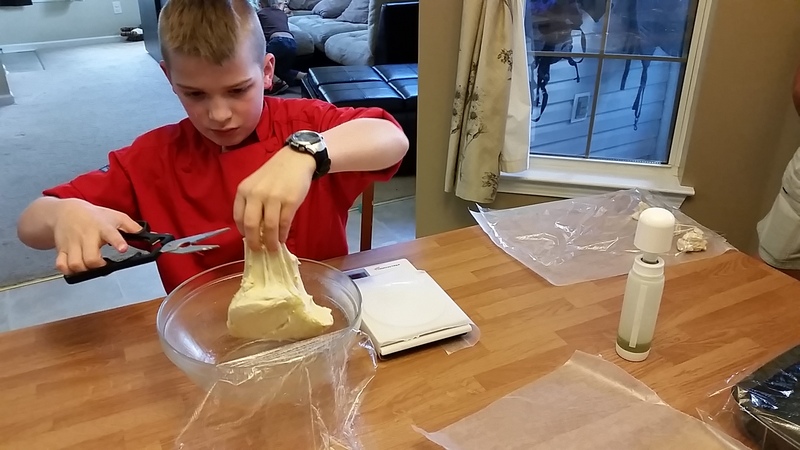 It’s a great way to learn practical math and science skills and also teaches the boys a useful craft. I keep telling them that when they get older, a great home-cooked meal from a guy will really impress any prospective wives. Even better, we’ve worked through several of Homeschool Legacy’s Unit Studies in the past and love them. I highly recommend them for your homeschool. In addition to the fun the kids have with them, my wife and I enjoy teaching through them. This one was no different, except for the bonus that we had some really great meals from it. If you want to try out this or any of the Homeschool Legacy studies, you can find them at their main website HERE or at many of the homeschool conferences. I’ve bought books from them at both. Alright, enough from me. I’ll turn it over to my son. This unit study tells the history about the first four presidents, their wives, and their favorite desserts. It also shows you the recipe to make those desserts. Though I do not like cherries, it was pretty fun to make. I got to roll the dough and everything. 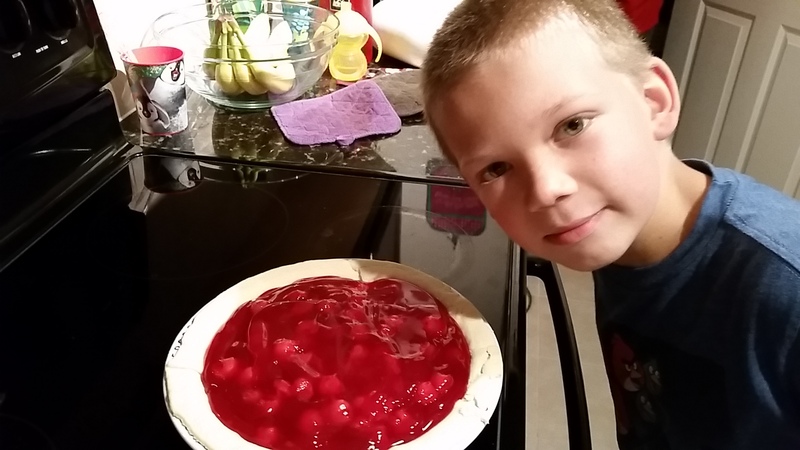 I also poured in the pie filling. We also learned about Mr. Washington’s wife. They had a fairly confusing relationship because they were seldom together. It was pretty cool to hear that Martha helped the injured at Gen. Washington’s military camp. The second president we learned about was John Adams. He and his wife were the first presidential family to move into the White House. The funny thing is that they moved into the White House while it was still being built. They stayed in one of the only rooms that was finished, and Mrs. Adams did not have a clothesline so she hung them in one of the unfinished rooms. The most absolute coolest thing is that John Adams had a pet alligator. My dad and I think that he got it because they did not have a Secret Service yet. We do not know for sure yet though. We are not done with the book yet, but we are looking forward to finishing it, and I can’t wait to make more desserts. I highly recommend this to other homeschoolers. It is very fun and tasty at the same time. 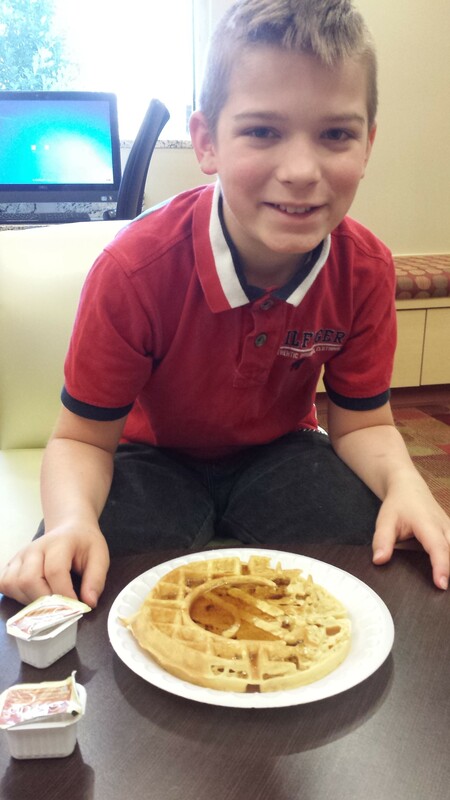 I Love My Marriott Waffles! About a month ago I stayed at a hotel, and I love continental breakfasts, but Marriott has the coolest waffle maker. When you make the waffle it imprints the Marriot logo on to the waffle. I personally think that is just awesome and I really want one that imprints my name in the waffle. You’ve just read your way into Abishai’s Food Lab. 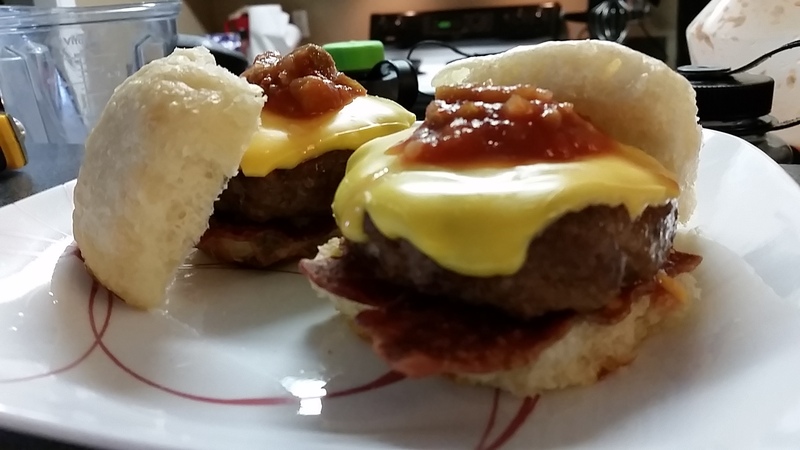 I am Abishai Powers and this is a brand new recipe I created for Mexican Meatloaf Sliders. I was inspired to create this to fulfill a bucket list goal for me and my dad. He talks to us a lot about what he learns from Tim Ferriss, and we want to meet him. I find that some of it goes over my head, but dad helps us understand how to take what we need to learn out of all the jumble of what everyone wants to make you learn. 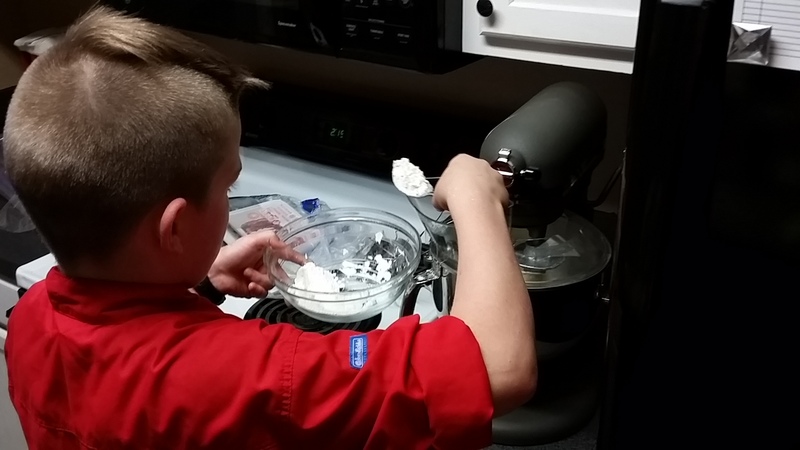 Tim’s contest is the first time we had heard about ChefSteps, and we have really enjoyed their classes. Mom has made part of our homeschooling program and I couldn’t be happier. 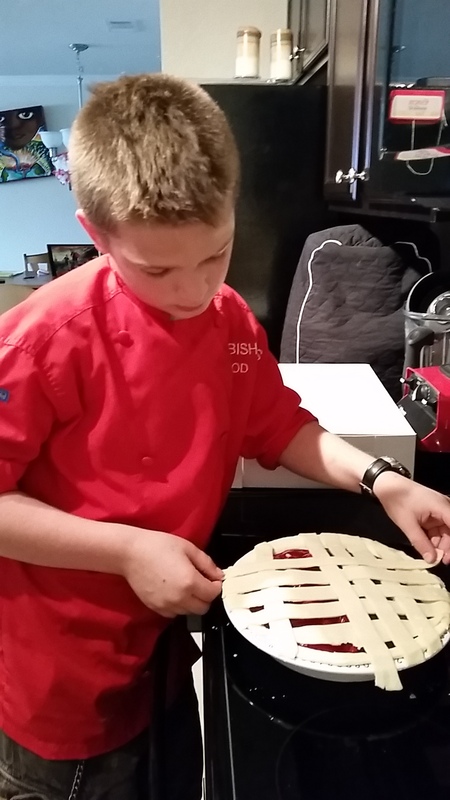 I watch shows like Masterchef Jr., and I want to be able to cook like that. ChefSteps helped me change the way we cook. We discovered that we like weighing ingredients instead of measuring them, because I too, hate doing all those dishes! 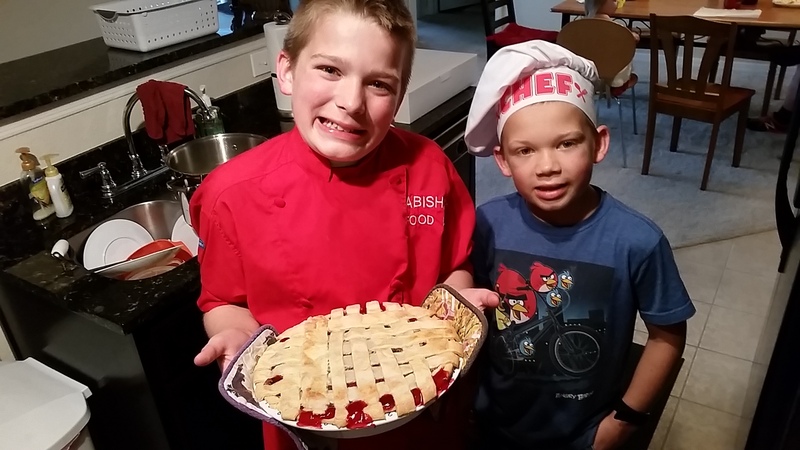 Mom and I worked together on this recipe and I hope you enjoy it as much as we did. My grandparents came over and helped us with the tasting. They gave it a big thumbs up! Mix the ground meat and egg whites together until well blended. Add Worcestershire Sauce, Bread cumbs, Garlic, Chili, and Onion powders, Pepper and sea salt. Mix with ground meat well and set aside. Mix together Onions, tomatoes, Jalapeño, and bell pepper. Add seasoning salt and mix well. Fold veggies into meat carefully but thoroughly. Make your patties to the size you want. 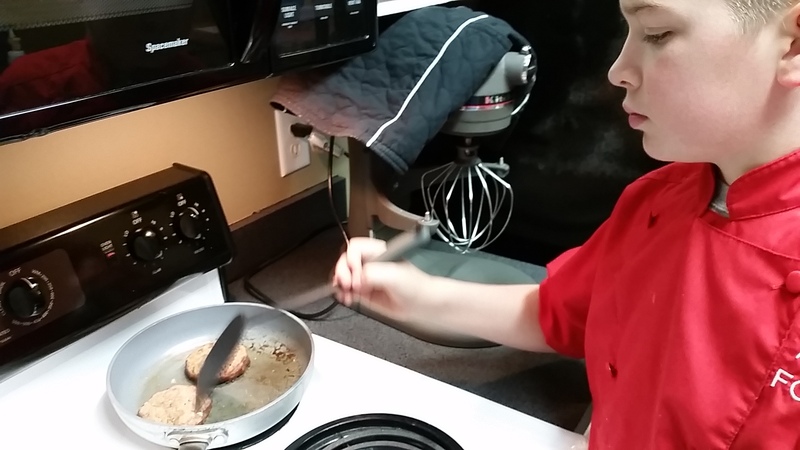 Bake the patties on 350° for 15 – 20 min. Then drop them onto a preheated grill or pan and cook for 2 min on each side. You can always top your burger with the things you love. The choices I made were to use crispy turkey bacon and grated cheddar cheese as my bun protector. Keeping the patty juices from making the bun soggy. Top the patty with a slice of American cheese, because it’s my favorite, but my dad preferred the pepper-jack. Then we gave ourselves a nice helping of homemade salsa to give added southwestern Pizzazz. In a recent blog, Seth Godin said that “Just about everything tastes better toasted”. He’s not just talking about food. Seth says you can also toast ideas, services, products, and relationships. To toast means that you are putting in the effort to do something nice or special for someone or something. You are customizing what you do to fit a particular persons needs. Let’s talk science. 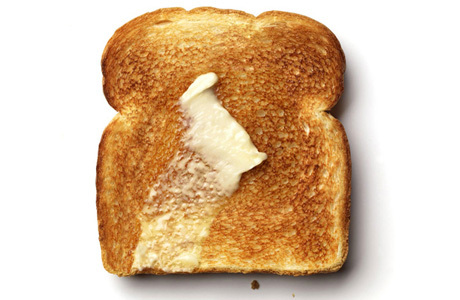 Seth said, “The Maillard reaction is a chemical reaction between amino acids and reducing sugars that gives browned foods their desirable flavor.” The reason toast turns brown is because the heat is melting the sugar, and when sugar is heated it turns brown. The hotter the heat the faster it turns brown. It is because of the Maillard reaction that things like hamburger buns and your everyday loaf of bread are brown. In the factory they bake them so that they taste better. The same concept is also applied on things like pork, french-fries, biscuits, popcorn, and tortillas. It’s just that you never think about it that way. I enjoy making toast the old fashion way, in a pan, because I find it more fun than just popping something in a toaster and leaving it to the machine overlords. My brother, Benaiah, would rather do it with a toaster. 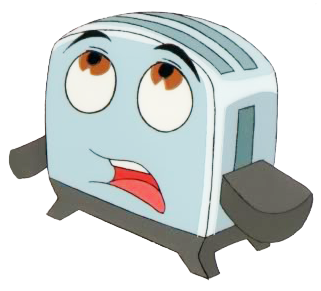 He thinks that if you toast the bread in a toaster you can walk away and do other stuff. My brother also prefers toast over bread because he likes that it crunches in his mouth. I like toast because it brings a specialness to my plate that a plain piece of bread lacks.